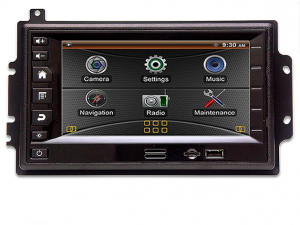 A key technology focus for Lectronix is the design and manufacturing of rugged displays for vehicle environments. You can see some of these innovative systems in our products section. Over the years we have been a key partner to major Tier One automotive companies developing these sorts of advanced head unit systems. We’ve put a dual display into a hydrogen fuel cell car, delivered solutions for motorhomes, trucks, and police cars, provided advanced software platforms, designed entire high-end navigation systems, and in general been a trusted partner for advanced engineering of cutting edge systems. Through this focus we have grown capabilities and in-house technologies that we now offer as design accelerators for new programs with our customers. We have established supplier relationships with the leading LCD panel providers for automotive grade displays. We are experts in touch screen technologies, and achieving optimal performance for various applications. Our projects generally involve high-speed digital video capabilities and we have continuously refreshed our designs to the latest state of the art approaches for moving video throughout a vehicle. Our core designs for processors, power supplies, protected I/O, audio, and CAN networking, are highly-robust and optimized for cost, EMI, and performance. These systems tend to be highly complex software undertakings. We provide proven platforms including Android and Yocto Linux for a starting point, and our experienced software team can assist with developing new middleware and user interfaces for specific applications. Many of our key programs for vehicle displays have originated from our innovative approaches for advanced software architectures. By working with Lectronix, you take advantage of the tremendous head start we provide in development, and our engineering team will quickly gain your confidence and respect for customizations. If you are looking for a partner to help create a custom in-vehicle display, you are exactly in our wheelhouse and we’re excited to discuss. Give us a call and you’ll be talking with experts in no time!